On April 15th, 2019, Brooklyn Creative League will celebrate its 10-year anniversary! After a decade in business, we’re humbler, wiser, and exceedingly grateful that we’ve been able to reach this milestone. Reach out directly to the members below for more information and/or to take advantage of these generous offers. As an ongoing special rate for BCL members, A Child Grows in Brooklyn, Brooklyn's largest and oldest parenting resource, is offering 20% off of advertising on their site. Please reach out to Shelly Schoen-Rene, Shelly@achildgrows.com for media kits, offer valid all year long. Additionally, Shelly is offering a free 20-minute problem solving session with Brooklyn Growth Machine for discovering new ideas for resolving stubborn or complex process, policy, or organizational challenges. The free 20-minute problem solving session is for April, only. With more than 15 years of professional business experience, Schoen-Rene has experience with corporate, small business, and nonprofit organizations and holds a Master of Administration degree from NYU. As a Shipley trained and CF-APMP certified proposal writer and a PMP certified project manager, Schoen-Rene has contributed to more than 100 government service proposals (local, state, federal, and international; worth 5K to hundreds of millions) as leader, writer, solution developer, capture, designer, and BD manager since 2004. Seron Security is offering a Free Network Assessment and Website Accessibility Compliance report to any BCL member who contacts them to schedule these in the month of April. Contact alden@seronsecurity.com for more information. Conduct a review of administrative, physical, and technical safeguards in place to protect the company’s and its clients’ information, including anti-malware and anti-virus software, firewall, patching, password policy, multi-factor authentication, blocking dangerous sites, and disaster recovery. Evaluate internal documentation of relevant processes. Review type of data collected and used to ensure the company is in compliance with relevant regulations and laws (e.g., HIPAA, FINRA, GDPR, PCI). Review site to ensure compliance with website accessibility guidelines, presented in plain English along with recommendations for fixing any issues. Seron Security’s mission is “To help small businesses protect themselves, stay compliant and succeed in today’s world.” Seron Security is a Security Technology Company, registered in New Hampshire. Seron Security was founded after experiencing what happens when a small business website gets hacked, and we saw the need for small business to have a robust, affordable secure solutions for professional organizations. Daniel Lim Consulting is offering a 30% discount (reduced price of $735) for the month of April on any of their organizational development and social justice training workshops. Check out their most popular workshops, or feel free to request a customized workshop of your own! The 30% discount only applies to training workshops for up to 20 participants, that last 90 minutes, and that are held at the latest by June 30, 2019. BCL members can also request larger or longer training workshops at a 20% discount any time of the year and can also enjoy an evergreen 20% discount on our training, facilitation, and consulting services. Contact Daniel Lim at daniel@dlimconsulting.com. We are a queer, people of color-owned company that helps build life-affirming and socially just organizations and communities through training, facilitation, and consulting. We work in direct response to the violence committed against so many members of the web of life: indigenous and societies of color, women, LGBT people, laborers, and all plant and animal people of this planet. Do you have a child whose going to college? Edvice Princeton is offering a Friends & Family 10% discount for members in April who choose Full Service College Counseling. Contact Chris Pluta at chris@edviceprinceton.com for more information. Edvice Princeton is an international educational consulting firm committed to helping students and their families navigate the complexities of admission processes. I (Chris Pluta) am a former admissions officer at the University of Pennsylvania and Barnard College, and a former college counselor at Horace Mann School and Lycée Français de New York. My approach is student-centered and counseling-based. Want expert advice on your current marketing activities? Need to brainstorm for an upcoming product launch or event? Get 25% off a 90-minute digital marketing coaching session; that's one session for $300 (regularly $400). Learn more about our areas of expertise (digital marketing, social media marketing, brand strategy) at mediavolery.com. Contact Zontee Hou at Zontee@mediavolery.com for more information. Your coaching session can be conducted via web-conference or in-person at BCL. Appointments must take place prior to September 1, 2019. At Media Volery, our focus is on developing digital strategies and content that help tell your brand’s story and achieve your goals. Current clients range from solo-preneurs to mid-size companies looking to focus their resources with targeted marketing strategies built with metrics in mind. With our help, our clients create genuine connections between their brands and their target audiences every day. Are you ready to transform your life through dance? No experience is needed to enjoy classes at Dancewave, who is offering 25% off two or more adult dance classes from now until April 30th for BCL Members. Take a look at their list of classes to see what interests you. Use coupon code: BCL25 at checkout. Founded in 1995 by Artistic/Executive Director Diane Jacobowitz, Dancewave’s unique model combines rigorous training with artistic integrity in a supportive environment. Students are mentored by accomplished dance professionals, which allows for personal growth as well as superior dance education. Dancers have the opportunity to join our pre-professional dance companies, where they gain technical proficiency and self-confidence through training, rehearsals and performances. 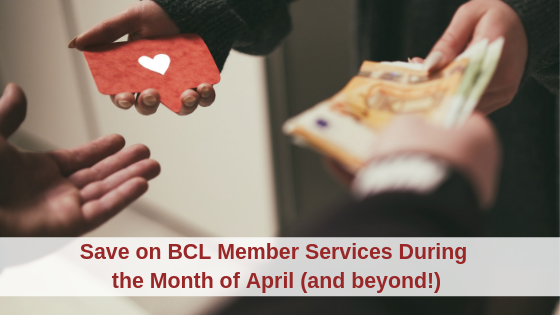 BCL members, if you’d like to offer something, please let us know by April 12, and we’ll update our blog post to include your offer! Click here for the submission form.